OSWEGO, NY – A group of Fitzhugh Park Elementary School students simply wanted to use arts and crafts to help to others. Shown recently with a breast cancer awareness quilt that will be raffled off as part of the Fitzhugh Park Elementary School’s “Crafting for the Cure” group’s fundraising efforts for Golisano Children’s Hospital and Oswego Oncology are back row from left: McKenzie Westberry, Alexis Thompson, Alix Pauldine, Cameron Crawford, Kailly Santos, Christine Haessig and Chelsea Gunther. Front row from left: Jake Jenkins, Kyla-Rae Barnes, Brenna Williams, Cassidy Goodwin, Megan Corrice and Hailey Gill. 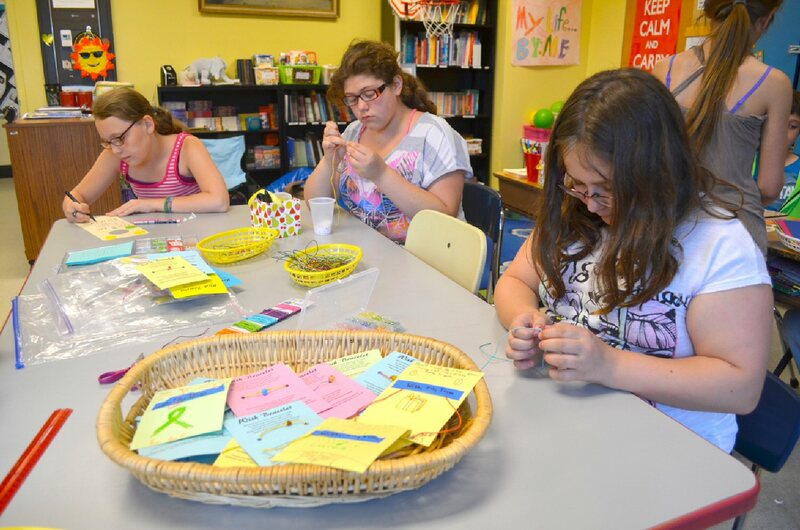 Last year, sixth graders Alyssa Searor and Maddy Graham came up with the idea of doing something you enjoy, like making crafts and then finding a way to help others benefit from these efforts. 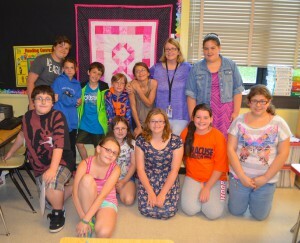 With the guidance of their teacher, Christine Haessig, a group “Crafting for the Cure” was formed and a goal was made. These dedicated students raised more than $1,000 thanks mostly due to the generosity of our Oswego community. Donations collected were presented in equal amounts to Golisano Children’s Hospital and Oswego Oncology. This year, fifth and sixth graders have continued this good work and will be ready to share their crafts with the community on June 11 from 4:30 to 8 p.m. at Oswego’s Farmers’ Market. At the market the various items will be available with students asking for donations for the same worthwhile causes as last year. According to Haessig, they also have a beautiful breast cancer awareness quilt made and donated by a former FPS parent, Kathy Taylor. 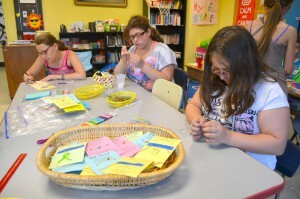 Making Wish Bracelets are from left: Kyla-Rae Barnes, Hailey Gill and Brenna Williams. Students have decided to raffle off the quilt to raise additional funds. Haessig also noted that students often work during the last time block at school, and some even volunteer to stay and work until 5 p.m., while others choose to take supplies home. “These students are dedicated to the cause, which is personal for so many,” she said. Many crafts are made with supplies provided to the school by JoAnn Fabrics in the Oswego Midtown Plaza and the Greater Oswego Chamber of Commerce waived their fee for the Farmers’ Market. “We greatly appreciate the continued support from our community for this great cause,” said Haessig. Students get ideas simply by looking at the supplies in front of them. Fifth grader Alix Pauldine has been working on Tic Tac Toe bead boards, miniature basketball hoop games, inspirational bookmarks and door hangers, while sixth grader Hailey Gill has been busy working on inspirational wooden wall hangings. Wish Bracelets are the craft that students have spent the most time making and have included inspirational messages. This Thursday night the community will be able to meet the students from Fitzhugh Park School during the weekly Oswego Farmers’ Market and support their wish for a world without cancer.